The Coffee and Peasant cantatas by J.S. Bach reveal a wordly – even parodic — side to a composer often associated with cerebral themes. The Coffee Cantata, written for a performance in Zimmerman’s newly founded Kaffeehaus, is a satirical exploration of a pernicious addiction to coffee. 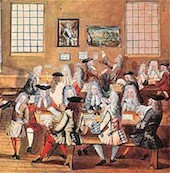 The black concoction, after its introduction into the Western world at the end of the 17th century, was worshipped by some – perhaps because of the drink’s putative status as an aphrodisiac – and reviled by others. Bach’s cantata on the subject is ferociously witty; it includes, amongst other numbers, a veritable love song to the delectable liquid: ‘Ei! Wie schmeckt der Kaffee süsse’ . The Peasant Cantata, no less profane in theme, can be described as a comic dialogue in music. The text, written in a dialect peculiar to Upper Saxony, describes, with close attention to all matters financial, the banal existence of two peasants, an unnamed farmer and his wife, Mieke. With 24 movements, it is one of Bach’s most elaborately structured cantatas; with only 2 singers and 3 permanent instrumentalists, it is also one of his most economically scored.